Meaghan is now officially a published author, but if you go and read her paper you will probably immediately reel back from the computer in confusion and horror. We don't blame you, as dental terminology is not for the faint of heart. So for those of you who are curious about the stuff that Meaghan writes about in a more professional sense, but don't have time to google what a posterolingual conule is, don't worry: we have a blog post for you! 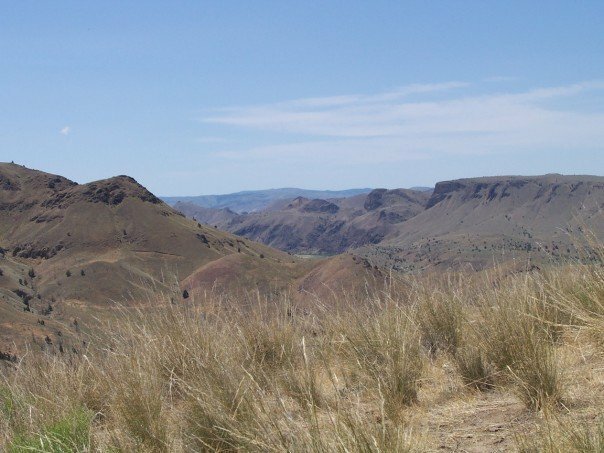 The most basic description of what this paper is about is that about 40 million years ago there was a species of oreodont that lived in Eastern Oregon. 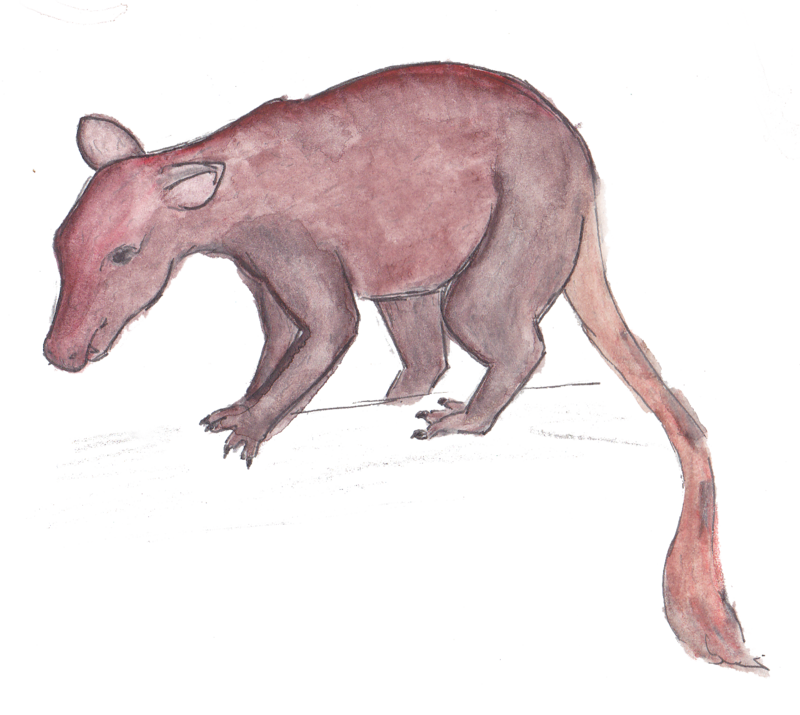 This species had claws, possibly for tree climbing, and it had a funny fat nose that made it look a little different from other oreodonts. possibly it looked vaguely like this except for maybe more in the lines and less... ginger. yeah, prolly less ginger. It also had giant fangs, but most oreodonts did because they're awesome and very bitey. Fang. Meaghan's hand for scale. 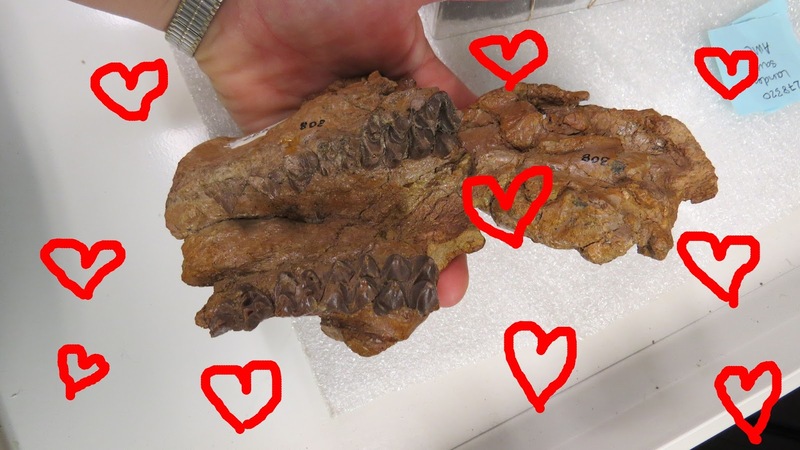 For about a decade, this oreodont was called Agriochoerus matthewi but Meaghan and her colleagues took a look at the teeth and realized that it was actually an entirely new species of a different genus of oreodont. They named it Diplobunops kardoula. 'Kardoula' means "little heart," which refers to the heart-shaped teeth that make it distinct from other species. It also is a term of endearment, which means that Meaghan got away with giving a new species a pet name. dawwww who's the cutest new species? YOU ARE, yes you are!!! Still with us? Wanna know what was so important and different about these teeth? Of course you do. Who wouldn't? In most oreodonts, the fourth premolar is pretty boring and unchanged - it can be used for chewing, but it's not very big and so doesn't help out all that much. 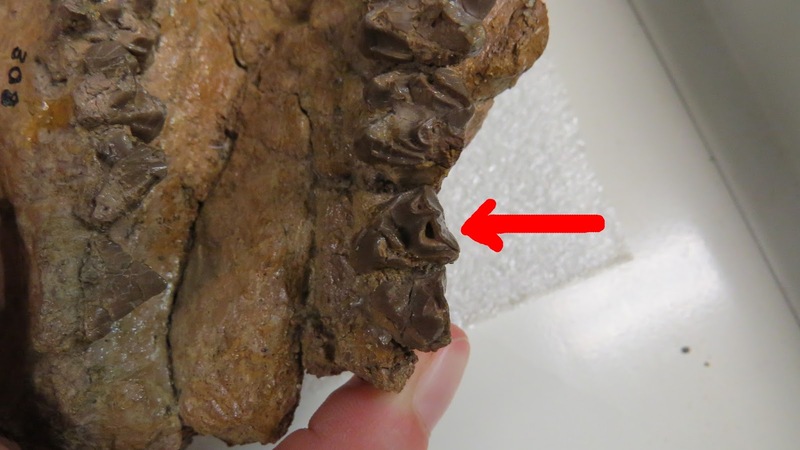 In this group of oreodonts though, the fourth premolar plays more of a role in chewing. It starts to look more and more like a molar, developing more little bumps to help grind up food. Diplobunops kardoula has a weird combination of the bumps on its teeth - it only has 3 on its fourth premolar, which is like other Diplobunops species, but it has no bumps on its molars, which is more like other Agriochoerus species. This is just one of a couple of things about Diplobunops kardoula's teeth that are very strange: the teeth also aren't as wrinkly, the premolars are heart-shaped, the lower fangs don't stick out so much to the side, and Diplobunops kardoula had a stronger chin. All these differences make this oreodont a little like Diplobunops and a little like Agriochoerus, so it's possible that Diplobunops kardoula is a link between those two genera... or maybe it means that people need to go back and fix what they're calling other oreodonts. Regardless, it's a new species not known from anywhere else. So that's pretty cool. Molar with a normal amount of bumps. Trust us, this is normal. There could be more. The oreodont from the Hancock Mammal Quarry is one of the many species that paleontologists have used to tell what time period they're looking at when they don't have ash samples to date. By matching formations that have our mis-identified "Agriochoerus matthewi" with other formations that have Agriochoerus matthewi and known dates, scientists can take an educated guess for the age of a set of rocks. The Hancock Mammal Quarry has an ash layer on top of it, but none below, and it's not clear how much time passed before that top layer of ash was deposited. That makes it difficult to tell how old the formation is, and people were previously using Agriochoerus matthewi to guess at the age of the Hancock Mammal Quarry. Now that we know that this oreodont is actually a new species, it's a little harder to tell what time the Hancock Mammal Quarry came from, and more work will need to be done. Sorry about that! That's pretty much all for the scientific significance of Meaghan's paper, but it does have a little bit of a personal ring to it. Meaghan first thought science was cool when she went to Hancock Field Station in 6th grade, a science outdoor school run by OMSI. Hancock Field Station is situated right next to the Hancock Mammal Quarry - Meaghan walked right by it when she was 12 years old, and learned all about the fossils. She went to camp assuming she was going to be a flight attendant, and decided when she left she was going to be a geologist-paleontologist-herpetologist. 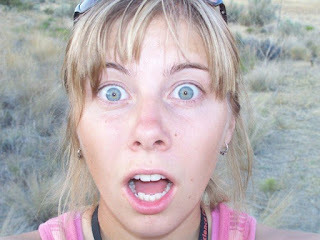 She then worked at Hancock Field Station for 10 years, which is where she met her current office mate when she was 16 (SMALL WORLD) and of course, her bestest friend and favorite co-blogger Amy Atwater. Hancock was pretty good to Meaghan, so she's pretty happy that her first paper is about the fossils that inspired her to paleontology in the first place.